My two boys love to read books. I sometimes find them sitting on the carpet completely engaged in a book, reading. I can almost see them flying on the waves of their imagination to faraway places. 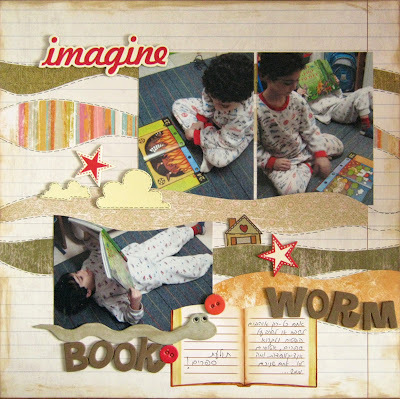 I love this LO because it shows the two of them, not even out of their pajamas, sitting and reading. The journaling on the little book is: "you simply love to sit down and read your books, atlases or even encyclopedia. You two are the cutest book worms". You are lucky they enjoy reading... great job on the layout. Thanks for sharing! דף נהדר! ואיזה כייף לשמוע שילדים בימנו קוראים! איזה כיף שהילדים אוהבים לקרוא !